A mucous cyst is a specific type of ganglion cyst in the finger. Mucous cysts are not cancerous. 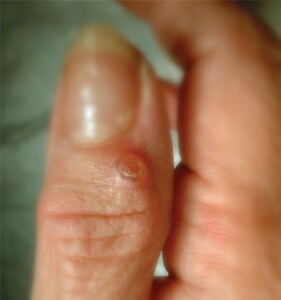 These cysts arise from the end knuckle of the finger, the distal interphalangeal (DIP) joint, closest to the fingernail. They are seen in both men and women often 50-70 years of age who have hand arthritis. Bone spurs (also called “osteophytes”) are a sign of arthritis seen on x-rays. Mucous cysts are filled with a clear, thick, jelly-like material which is thought to arise from fluid which has leaked out of the joint. Occasionally a ridge in the fingernail develops, which is caused by pressure on the root of the nail by the cyst. These cysts can fluctuate in size, and may go away on their own in some cases. Most of the time they are painless, but they can become painful after an injury to the fingertip. Sometimes the skin over the cyst is very thin, and if the cyst ruptures, an infection can develop. What is the recommended treatment for a mucous cyst? Cyst drainage: Draining the cyst with a needle can be performed in the clinic. However, many cysts come back afterwards and joint infection is possible. Therefore, this procedure is usually not recommended too often. Draining the cyst at home with a needle is not recommended due to the risk of serious joint infection. Surgical removal: Surgical removal of the cyst is performed in the operating room under local anesthesia. Most hand surgeons also recommend debridement of the osteophytes (removal of bone spurs) to decrease the chances of the cyst coming back. The procedure is outpatient and takes about 20-30 minutes. Skin sutures are removed after 10-14 days. Use of the hand is allowed as comfort permits after a few days. Stiffness, swelling, and “ache” in the joint is common for a few weeks, and often improve over time. Risks of surgery are low but include cyst recurrence (5-10%), joint pain, finger stiffness, infection, skin healing problems, and tendon injury.